By the way, to avoid being confusing to you, let me again ask a simple question: What in the heck was the mandate if it wasn't to stop Obama? We've got the exit polling data to prove it now, by the way. Sixty-one percent, stop Obama. There's no question, what else could it have been? The Republicans didn't run on a mandate. Individual Republican races did, but the Republican Party did not have a national brand or national identity. What could this election have meant? It could not have meant anything but stop Obama. The Republican Party did not run on a mandate , as recognized by Limbaugh, and voters quite clearly dislike Barack Obama. Their only mandate now is to "stop Obama," to oppose anything Obama because it is Obama, which has been their strategy for six year, national interest be damned. Two days before the election, a Washington Post blogger noted that the President was at -10 in his approval/disapproval rating and that individuals most likely to vote were even more negative toward him. Now, the left can't afford that. Stopping Obama is stopping liberalism. This was deep. This was big. Folks, this was a shellacking I think even broader and wider and deeper than 2010. This is huge what happened on Tuesday. It is major. It's gonna be a long time before the Democrats recover from this, and therefore they can't afford there to be an accepted explanation for this election result that means anything like what they believe in was rejected. They simply cannot let that stand. The left simply cannot afford for the truth of the meaning of their massive defeat to set in. So their buddies in the media and elsewhere throughout the party are gonna do everything they can to pooh-pooh it and try to call it something else. Minimum wage, you wouldn't believe some of the excuses they're concocting. Most obvious is the irony that Rush Limbaugh would cite minimum wage, given the overwhelming approval of it on Tuesday. However, that's the genius of Rush The Corporate Man- he never said minimum wage increases were turned down, only "minimum wage, you wouldn't believe some of the excuses they're concocting," thereby implying that voters rejected minimum wage increases. Limbaugh frequently refers to "low information voters," implying he means liberals, but he probably suspects that the term better fits his own listeners, and does his best to exploit their ignorance. The public's verdict, 4.5 to zero, on lifting the income of Americas's lowest-paid workers was decisive. 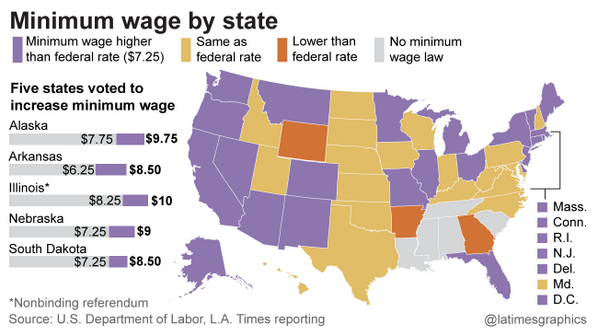 The minimum wage (map from L.A. Times Graphic) was raised in the left-wing enclaves of Alaska, Arkansas, Nebraska, and South Dakota, with the vote favorable, but non-binding, in Illinois. Voters' progressivism was less pronounced on other issues, with one victory (Montana), one defeat (Connecticut), and one draw on voting rights. In Missouri early voting was rejected, as summarized here by Colin Dailede, because it "came with too many restrictions." Dailede notes a gun control measure passed in Washington State, while two anti-abortion measures (in Colorado and North Dakota) went down and one (in Tennessee) was approved. 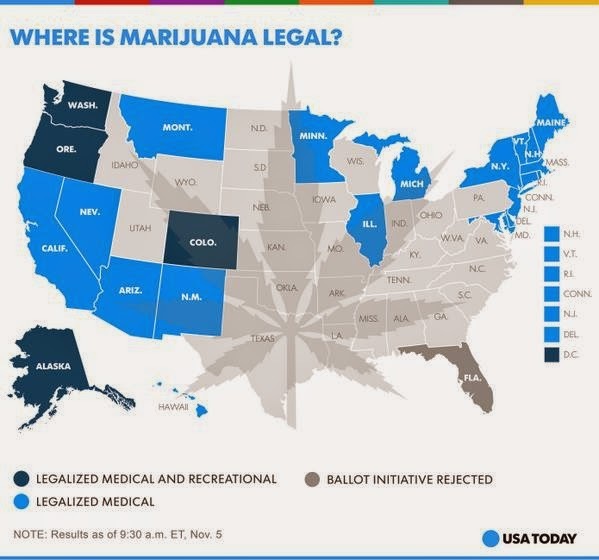 The voters' sentiment on marijuana legalization (map from USA Today) was particularly clear, with referenda passing in two states (Alaska and Oregon) and in the District of Columbia. A resounding majority approved legalization also in Florida but fell short of the 60% needed to amend the state's constitution. 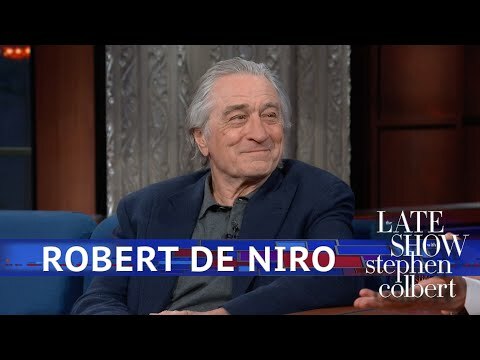 (We were spared cheap shots on this issue by the talk show host whose drug of choice once was Oxycontin- a gateway drug to heroin, as it were). But to win, of course, they'll also need to do more to address the needs of folks above the minimum wage. That means talking more about education -- runaway college tuition, slumping and underfunded public schools (and not just in the cities) and the need for more vocational training that matches actual jobs. (And speaking of jobs, why did the Democrats stop talking about extending unemployment benefits, when almost every voter has friends or family who've been without work for months or years?) Look at the remarkably simple stance of the only Democrat who ousted a big-deal Republican, Pennsylvania Gov.-elect Tom Wolf. Tax oil-and-gas companies. Fund schools. Pretty basic stuff.